The shôjo-manga magazine Margaret (Shûeisha Publishing) will publish The Rose of Versailles “Episode 4,” a new installment in manga-ka Ikeda Riyoko’s famous historical manga The Rose of Versailles, in issue #12 on May 20, 2014. Shûeisha has also announced their plans to publish an 11th volume of The Rose of Versailles along with a reprint of Vol. 1-10, featuring a retro cover [ed. I have the five-volume set, in which each vol. contains two of the original volumes]. The Rose of Versailles ran weekly in Margaret from April 1972 to December 1973. Lovingly referred to as “BeruBara,” the best-selling manga has sold over 20 million copies. In the past, BeruBara has been adapted into a variety of media in the past, including an anime, a film, and a Takarazuka Revue musical, and even now, the series is a widely recognized and popular part of the cultural landscape, with BeruBara stickers for the LINE text app and character goods. The self-contained (one-shot) piece in issue 12 is the fourth in a series of continuing new works called The Rose of Versailles: Episodes that began in 2013. The protagonist of “Episode 4” is Alain de Soisson, Oscar’s subordinate in the army, and his life after the French Revolution and the deaths of his beloved Oscar and sister Diane in a 56-page (5 in color) manga. The new Episodes series will be collected and published as an 11th volume. 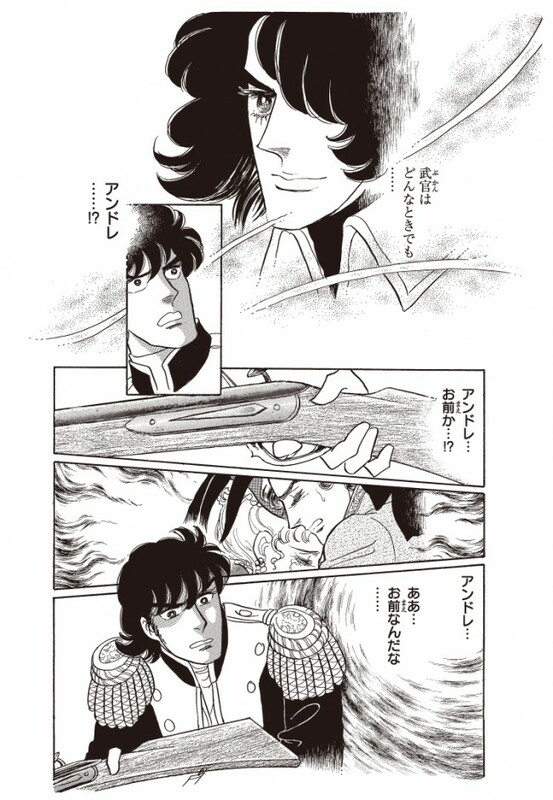 The gorgeous color pages will be reproduced and the 15-page “Episode 1” will be retouched for printing in the first new work in 40 years (a miracle indeed). Furthermore, in honor of the 11th volume’s publication, vol. 1-10 will be reprinted with a retro design. Issue 12 of Margaret will be loaded with BeruBara news and will be published on May 20. The Rose of Versailles Vol. 11 will be published on August 25, 2014 (price not set). The entire reprint of vol. 1-10 will be all at once published on July 1 (each volume will cost 410 yen). The drawing style looks more flat and the backgrounds simpler than in her original manga. Alain isn’t the type of person to be surrounded by flowers and sparkles, I guess? Has anyone read Episodes yet? I think I might have caught one of the Episodes while looking for some pages of the original and stumbling upon a brief flashback story about Andre and a little girl he promised to marry before going into Oscar’s service. Very short and sweet, and flowed a little like a fanfic drabble in that it’s just there to tug on the Andre heartstrings which have probably already been pulled taunt by the original. I can’t remember, but it didn’t strike me as over-sparkly. Well, since I’m here, do you have a specific wish list you’d like me to keep an eye out for? ^^ If so, we could pursue that conversation via email. I kinda dig the sparkles, but maybe only Oscar and Antoinette can bring the sparkles? Episode one tells about André’s youth. He was a little 8 years old boy when he lost his Mother and went to Jarjayes’ Palace in order to stay with his granny. Before his departure, he gave a souvenir to his little friend, Christine, and promised to marry her in the future. More years later, André meet Christine at the Palais Royal in Paris: she went to Paris to find André, and is now the girl-friend of Duke d’orleans. She realize immediately that André is in love with Oscar, and renounce to him. Episode two tells about how Young Girodelle discovered that Oscar was a girl before she become Captain of the Royal guards. Episode three tells about Fersen: after the death of queen marie Antoniette, He travels arriving in different european Courts. He finally arrive in Vienna, where Princesse Maria Theresa, antoinette’s daughter and prisoner of the Révolution, has been released and now live. Fersen see her for few minutes and get desperate. Brilliant, thank you for the comment! I think Takarazuka’s “アンドレ編” is about the story you described.